Did anyone accidentally buy my Fuji royal blue 5-speed bike with a mixte frame last year, thinking the salesperson was legit? 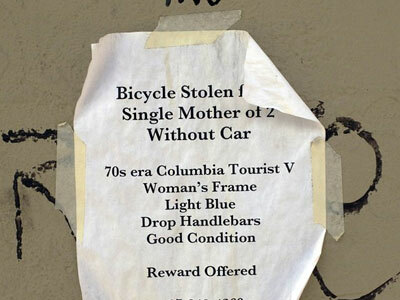 Try having your bike stolen from your apartment, by your neighbor! 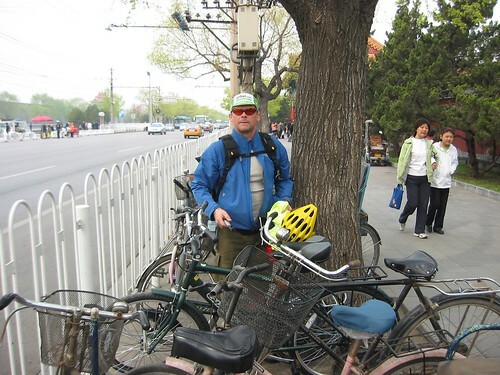 In this photo from Beijing, I used the obstruction technique to obscure our nice, new bikes among crappy, ancient, Chinese ones. All I had was a cable lock. Did not get stolen. Also the Kryptonite ball-pen legend still has legs. When I’m traveling, my folding bikes go where I go and that’s everywhere. Training, racing, and touring we use the buddy system and the bikes just aren’t out of our sight. On Bettie, I use Val’s immobilization techniques. Those include toe-strapping the front brake, disabling the motor, and cable U-locking the front wheel to the fork. That bike weighs more than an hundred pounds and it’s gonna take at least 3 or 4 tweaking meth-heads working together to hoist her into a truck. Discussed in this post from last year. I think until we get bike parking like Asian and European cities, this is a perennial problem. Reader Josh Boggs forwarded us an email from Grand Fondo Bicycles in Nashville that had 50K worth of high-end bikes stolen from their store. Earlier in the year, it was Lance’s bike and Zabriskie bikes as well.